Interoperability in contact smart card is key for the payment schemes. Any product shall comply with the latest specification from EMVCo. Carrying out the testing internally to assess easily and rapidly that the product is ready for the approval is a major step on product development. 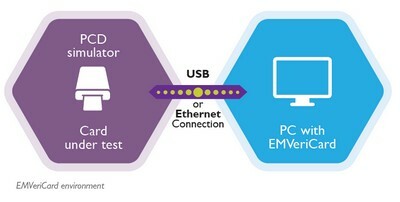 The EMVeriCard tool has been designed to help improve smart card testing by automating the processing of test scripts. It ensures the complete validation of your smart card. EMVeriCard is used for compliance testing of the protocol and electrical components of EMV Level 1 for CCD/CPA or any payment brand smart card. It helps to enhance global interoperability of smart cards and prepare for certification testing for Level 1 electrical and protocol requirements according to EMVCo test plan. The tool is EMVCo qualified. EMVeriCard comes with electrical and protocol libraries. For the details of the supported Electrical Test libraries and Protocol Test libraries supported by FIME tool, please download FIME brochure below. Store all ICC data related to the Implementation Conformance Statement (ICS). Perform post-control of data by string comparison between ICS and execution data. Select scripts for automatic test session. T=0 or T=1 protocol exchanges. Calculation and graphic presentation of timings. The test suite comes with all necessary hardware and accessories to run the tests. A CD-ROM for installation software. A USB token for product license.